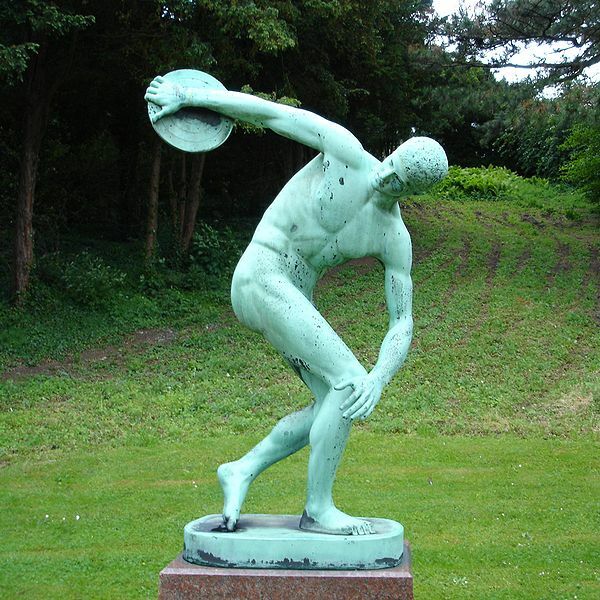 Bronze copy of Myron of Eleutherae’s “Discobolus” (discus thrower) in the University of Copenhagen Botanical Garden, Copenhagen, Denmark. Photo public domain via Wikimedia Commons. Bruce and I watched the Opening Ceremonies of the 2012 Summer Olympics in London last night—at least until we dozed in front of the telly, as it had been a long (though positively productive) day for both of us. It is always fun and interesting to watch this parade of diversity and cooperative competition, even though the difference in the wealth (and poverty) of nations makes too much difference even there. This morning, on Facebook, my friends were busy filling in where our U.S. media failed us in its much-criticized tape-delayed presentation. NBC’s lame and condescending excuses fell on deaf ears, but, in particular, two other issues caught my attention—about two parts of the Opening Ceremonies that NBC covered badly or simply deleted from view for U.S. audiences during the prime-time broadcast that nearly everyone watched. One of these was a tribute to Britain’s National Health Service, which evidently befuddled the announcers, based on their inane, even apologetic reaction. Meredith Vieira’s reaction to child performers dancing on their hospital beds was, “Y’know, those children don’t look very sick,” as though she just had to support the idea that universal health coverage creates goldbrickers. Duh, Meredith, there’s a difference between performers and actual patients. Probably Meredith just doesn’t realize that. She came across as ignorant and proud of it through her entire commentary. Matt Lauer and Bob Costas weren’t much better. Of course, the radical right takes the celebration of the NHS as a political statement, but director of the Ceremonies Danny Boyle insists that it simply was a testament to the values of the British people. I won’t post links to the crazies who are appalled by this, but what’s funny about them is how they are forced to demonize nearly the entire British people because of their devotion to the NHS. No matter how many falsely prepared reports about how terrible “socialized medicine” is supposed to be, it remains a fact that countries that have it—such as Britain and Canada—overwhelmingly love it. Sure, any large system has problems, but when entire nations are unified in their appreciation and approval of something, you know that it goes—or should go—beyond political differences. In the U.S., however, the pitched battle is ongoing about the fate of our healthcare system, and thus a simple celebration of the life-saving work of doctors and nurses in the NHS was weakly introduced and then we hit a cut-away to an ad. And the right-wingers love to talk about the “liberal media.” Hah. While it’s obvious why NBC might cower at the thought of ruffling feathers on the right these days, the other element missing in U.S. coverage is a more subtle issue. This was a tribute to the victims of the 7/7/2005 terrorist attack on London, shortly after it was announced London would host these Olympics. The bombings killed 52 people, who were honored last night with a somber dance number and Scottish singer Emeli Sandé singing “Abide with Me.” NBC cut this entirely and substituted a flaccid interview with swimmer Michael Phelps. Why? Of course, every moment of the Olympics can’t be covered on TV—there aren’t enough hours in the day—and editorial decisions must be made. But to cover over something like this with some pre-recorded (and frankly really boring) interview? For me, this comes back to the issue of enforced and fakey positivity. I’m guessing that NBC didn’t want any of their advertisers to be associated with any “downer” content, and NBC’s producers and editors seem to have thought that a memorial to the dead was not cheerful enough for the Opening Ceremonies. Instead of respecting the decisions of the artistic directors of the Ceremonies, they substituted their own judgment and their own content. To me, that is a failure to broadcast the event they are supposedly covering as reporters and that I tuned in to see. What’s amazing and shocking about this is not only its callousness, but the fact that journalism, too, is held hostage by the blithering positivity idiots. NBC has already been criticized for allowing their journalistic coverage to be expanded to support their prime-time stake in the Olympics, something completely against the journalism code of ethics. And now they aren’t even covering it in a spirit of journalistic integrity but as a puff conveyor for advertisers. It’s also just another example of how cruel the positivity idiots are. I find it supremely ironic that in the name of positivity, what these people so often spread is unkindness, in this case the blotting out of a tender testament to innocent victims of terrorism and their remaining loved ones. What an important statement to be making during this international event that brings together such disparate people. At any rate, it gets the coverage of the Olympics off to a bad start. Who can trust the coverage not to be a rah-rah falsehood all the way around? Let’s all make sure to supplement our watching with some careful reading and watching elsewhere. It may be a challenge, partly because YouTube has provided live streaming in every country but the U.S. Readers here speculate that NBC has put the legal kibosh on open access here. Who knows? But we can still dig around a bit and head on over to the BBC and the CBC websites. Here’s to the power of the web for keeping us from missing the rest of the show! Posted in Culture & Arts, Online Media, Politics & Current Events and tagged 7/7 terrorist attacks, Bob Costas, Britain, Danny Boyle, journalistic ethics, Matt Lauer, Meredith Vieira, National Health Service, NBC, Olympics 2012, poor media coverage. Bookmark the permalink. I love how there’s this characterization of the world’s oldest colonial nation as “socialist” these days. Very funny. The Queen must love it.